Looking for Quinceañera Makeup? On Fleek Makeup & Wax Studio provides on-site and off-site makeup services. Quinceañera Makeup by our team. This makeup look was done to match the Quinceañera’s dress. We all want the best for our Quinceañera’s big day! Quinceañera are big life celebrations that only come once. On Fleek Studio understands the importance of these life events. With over 8 years of experience, our makeup artists strive to provide a flawless look that makes a statement. Only long lasting makeup that will last through the tears of joy is used. Large parties and groups can be accommodated with multiple makeup artists upon request. Where are Quinceañera (XV) makeup services provided? Quinceañera makeup services are provided both on-site and off-site. On-site services are offered in our store just minutes from Santa Rosa, CA on the Windsor Town Green. 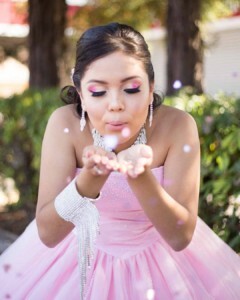 Off-site quinceañera makeup services are offered in the Sonoma, Napa, Marin, Mendocino and surrounding areas. Further locations can be accommodated upon request. Makeup trials are highly recommended to achieve the exact look the Quiceañera wants. Many Quinceañeras bring in examples of what they would like their makeup to look like on their big day. Our artists can gauge what works best with the Quinceañera’s skin during the trial. The makeup artists with also ask the quiceañera what type of “look”they’re going for. Makeup artists at On Fleek Studio can create any look from glam to more traditional looks. Makeup trial services are offered at 624 McClelland Drive, Windsor CA 95492. Makeup Trials include a 1-hour one-on-one consultation with the makeup artist. Group rates are available! On Fleek Makeup & Wax Studio offers competitive group pricing. For more information email us at info@onfleekstudio.com or give us a call at (707) 657-7671. Looking for something else? Take a look at our other makeup services!